Who wins and who loses from the tax bill? 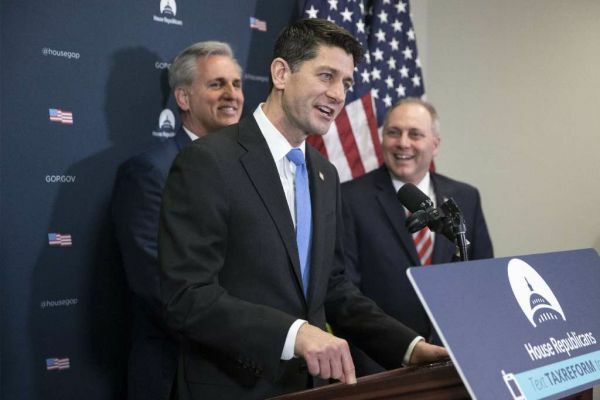 By Louis Jacobson on Tuesday, December 19th, 2017 at 2:46 p.m.
How would the Republican tax bill impact different types of taxpayers? We took a closer look. As Congress nears passage of a Republican-backed tax bill, there’s been a lot of discussion about who will benefit and who won’t. Here is some data about the winners and losers under the bill. We’re using data from two sources. One is the Joint Committee on Taxation, the nonpartisan group that analyzes tax bills for Congress. The other is the Urban Institute-Brookings Institution Tax Policy Center, an independent group that models the effects of tax legislation. Both groups analyzed previous versions of the bill, but in this article we’ll look at their analyses of the final version that, assuming it passes and is signed by President Donald Trump, will become law. We’ll look at a few key issues. • Will poor, middle-class and rich Americans all benefit, on average? • Are the gains for each income group proportionate to their share of the tax-paying population? • Can taxpayers expect any gains to last? Here’s our first chart, which uses Joint Committee on Taxation data. It shows how various income ranges would fare in 2019 -- the first year the committee looked at -- under the bill. We’ve listed the overall change in taxes paid for each income group, with cuts noted as negative and increases noted as positive (the second column). We then calculated the share of those gains received by each income range (the third column), and compared that to the percentage of taxpayers who fall into that income range (the fourth column). That said, the benefits of the tax bill would flow disproportionately to wealthier taxpayers. About half of the households filing returns had incomes below $50,000, according to the Joint Committee on Taxation, but they collectively get just 6.6 percent of the tax gains in the bill. By 2027, every income group below $75,000 sees a tax increase. Only those income ranges above $75,000 still see a cut by 2027. That’s a significantly different pattern than in 2019, when every group saves, on average. Meanwhile, if you look at the income groups who gain in 2027, there’s an even stronger skew toward the wealthiest taxpayers. The top 1 percent of taxpayers -- those earning at least $500,000 -- take 48 percent of the gains. Why the big changes by 2027? The primary reason is that some of the individual tax cuts phase out in 2025. In addition, some of the inflation adjustments used under the bill are less generous than the current ones. Now remember that the previous charts reflected the cumulative gains for each income range. However, the fact that members of an income range gain collectively doesn’t mean that every single member of that income group is better off -- it just means that, on average, gains outpace losses. The reality is that some taxpayers in every income group will lose, even when their group gains as a whole. For 2018, the likelihood of benefiting from the bill isn’t 100 percent, but for every group, there are many more gainers than there are losers. Indeed, for all but the top 1 percent, no income group has more than a 7.6 percent chance that of losing ground under the tax bill in 2018. So what happens by 2027? Notice how the benefits shrink for most taxpayers in 2027. Almost 76 percent of households in the top 1 percent would see a tax cut. And almost 92 percent of households in the top 0.1 percent would see a tax cut. The top 1 percent in 2027 are projected to earn $912,000, and the top 0.1 percent is projected to be making more than $5 million a year. But fewer than one-third of taxpayers in the bottom 80 percent of the income spectrum would see a tax cut in 2027.